Primaquine is used with other medications to prevent and treat malaria caused by mosquito bites in countries where malaria is common. Malaria parasites can enter the body through these mosquito bites, and then live in body tissues such as red blood cells or the liver. Primaquine is used after other medications (such as chloroquine) have killed the malaria parasites living inside red blood cells. Primaquine then kills the malaria parasites living in other body tissues. This prevents the return of the infection. Both drugs are needed for a complete cure. Primaquine phosphate belongs to a class of drugs known as antimalarials. Take this medication by mouth, usually once daily with food to prevent stomach upset, or as directed by your doctor. Follow your doctor's directions exactly. Primaquine is usually taken for 2 weeks after you have left the malarious area. It is started during the last 1-2 weeks of your other malaria treatment or immediately after you have finished your other treatment. Primaquine should not be taken for more than 14 days for malaria treatment. Dosage is based on the kind of infection you have and your response to treatment. Take this medication regularly. To help you remember, take it at the same time every day. It is important to prevent mosquito bites (such as by using appropriate insect repellents, wearing clothes that cover most of the body, remaining in air-conditioned or well-screened areas, using mosquito nets, using insect-killing spray). Buy insect repellent before traveling. The most effective insect repellents contain diethyltoluamide (DEET). Ask your doctor or pharmacist to recommend the appropriate strengths of mosquito repellent for you/your children. No drug treatment is completely effective in preventing malaria. Therefore, seek immediate medical attention if you develop symptoms of malaria (such as fever, chills, headache, other flu-like symptoms), especially while in the malarious area and even after completing this prescription. Quick treatment of malaria infection is needed to prevent serious, possibly fatal, outcomes. When using primaquine phosphate for treatment of infection, tell your doctor if your condition persists or worsens. What conditions does Primaquine treat? Nausea, vomiting, dizziness, stomach upset, and abdominal cramps may occur. If any of these effects persist or worsen, tell your doctor or pharmacist promptly. Tell your doctor right away if any of these rare but very serious side effects occur: signs of serious infection (such as high fever, severe chills, persistent sore throat), signs of a sudden loss of red blood cells (such as severe tiredness, brown urine, pale lips/nails/skin, fast heartbeat/breathing with usual activities), signs of a certain blood problem (methemoglobinemia, including bluish skin/lips/nails, headache, shortness of breath, lightheadedness, weakness, confusion, chest pain, sudden pounding heartbeat). Get medical help right away if any of these rare but seriousfast/irregular heartbeat, severe dizziness, fainting. List Primaquine side effects by likelihood and severity. Before taking primaquine, tell your doctor or pharmacist if you are allergic to it; or if you have any other allergies. This product may contain inactive ingredients, which can cause allergic reactions or other problems. Talk to your pharmacist for more details. Before using this medication, tell your doctor or pharmacist your medical history, especially of: immune system disease (such as lupus, rheumatoid arthritis), blood problems (such as low white blood cell counts, anemia), history of blood problems due to primaquine (such as hemolytic anemia, methemoglobinemia), personal/family history of favism, low levels of certain blood enzymes (glucose-6-phosphate dehydrogenase-G6PD, NADH methemoglobin reductase). Your doctor may order a blood test to see if you have any enzyme deficiency before starting primaquine. Primaquine may cause a condition that affects the heart rhythm (QT prolongation). QT prolongation can rarely cause serious (rarely fatal) fast/irregular heartbeat and other symptoms (such as severe dizziness, fainting) that need medical attention right away. The risk of QT prolongation may be increased if you have certain medical conditions or are taking other drugs that may cause QT prolongation. Before using primaquine, tell your doctor or pharmacist of all the drugs you take and if you have any of the following conditions: certain heart problems (heart failure, slow heartbeat, QT prolongation in the EKG), family history of certain heart problems (QT prolongation in the EKG, sudden cardiac death). Low levels of potassium or magnesium in the blood may also increase your risk of QT prolongation. This risk may increase if you use certain drugs (such as diuretics/"water pills") or if you have conditions such as severe sweating, diarrhea, or vomiting. Talk to your doctor about using primaquine safely. This medication must not be used during pregnancy. It may harm an unborn baby. Women of child-bearing age should have a pregnancy test before starting this medication. It is important to prevent pregnancy during and after treatment with primaquine. Men and women must use reliable forms of birth control (such as condoms, birth control pills) during treatment. Men should continue to use birth control for at least 3 months after the end of treatment. Women should continue to use birth control for at least 1 menstrual cycle after the end of treatment. If you become pregnant or think you may be pregnant, tell your doctor right away. While you are pregnant, traveling to an area with malaria puts you and your infant at a much higher risk for death and other problems. The CDC recommends continuing your other malaria treatment (such as chloroquine) throughout pregnancy until delivery to prevent harm to your unborn baby (hemolytic anemia). After delivery, you may finish treatment with primaquine. Discuss the risks and benefits with your doctor. It is not known whether this drug passes into breast milk and the effect on a nursing infant is unknown. The doctor should test your infant for G6PD deficiency before breastfeeding. Consult your doctor before breast-feeding. What should I know regarding pregnancy, nursing and administering Primaquine to children or the elderly? Some products that may interact with this drug include: penicillamine, quinacrine, drugs that may cause decreased blood cells (such as trimethoprim, zidovudine, pyrimethamine, azathioprine). Does Primaquine interact with other medications? Should I avoid certain foods while taking Primaquine? If someone has overdosed and has serious symptoms such as passing out or trouble breathing, call 911. Otherwise, call a poison control center right away. US residents can call their local poison control center at 1-800-222-1222. Canada residents can call a provincial poison control center. Symptoms of overdose may include: extreme drowsiness, seizures, fast/irregular heartbeat. Laboratory and/or medical tests (such as G6PD blood test, blood cell counts) should be performed at the start of treatment and periodically to monitor your progress or check for side effects. Consult your doctor for more details. 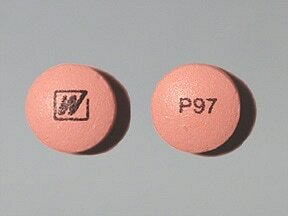 This medicine is a pink, round, tablet imprinted with "W" and "P97". Are you considering switching to Primaquine? How long have you been taking Primaquine?